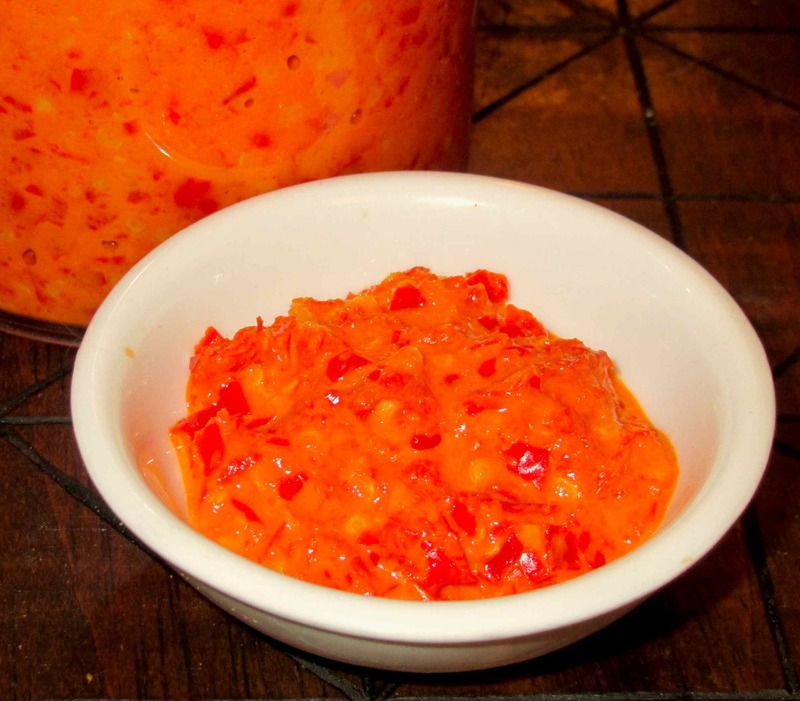 Vegetable Oil – Approximately 2 – 3 tablespoons per cup of chopped chilies. First, chop the chilies coarsely. If you like, you can remove the seeds and the white pith from inside first as this will make for a much prettier end-product (especially with larger chili varieties), and will also tone down the heat a little, if that is a concern. I am omitting that step here, though, as the seeds in these chilies are relatively small and it would be extremely time consuming to clean them all completely. In compromise, I simply swept away any seeds that escaped as I chopped each chili and didn’t get fanatical about removing each and every one. All in all, I probably removed about a third of the total and even this took me a good hour to accomplish. 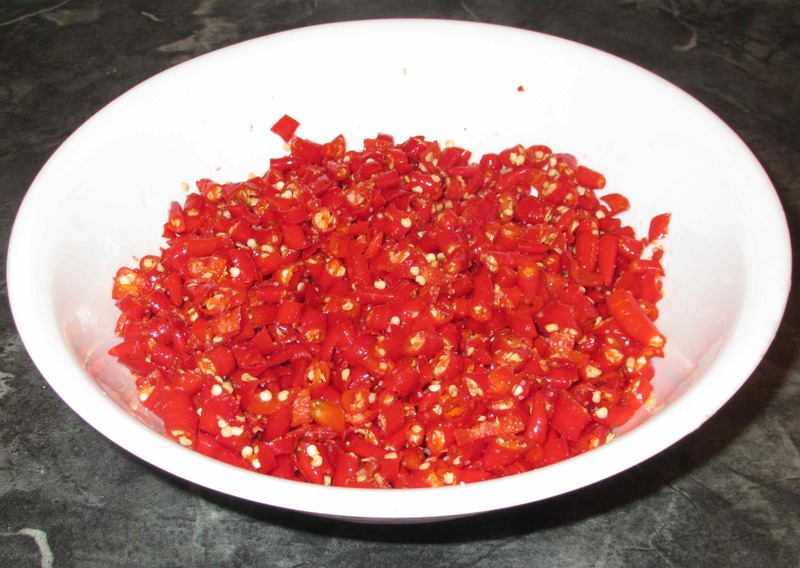 Once you are done, add the salt, mix well, and leave the chilies to sit for a couple of hours to soften. I ended up with a little over 2 cups of chopped chilies and chose to add 4 teaspoons of salt. You can use less, but the paste will keep longer with more. 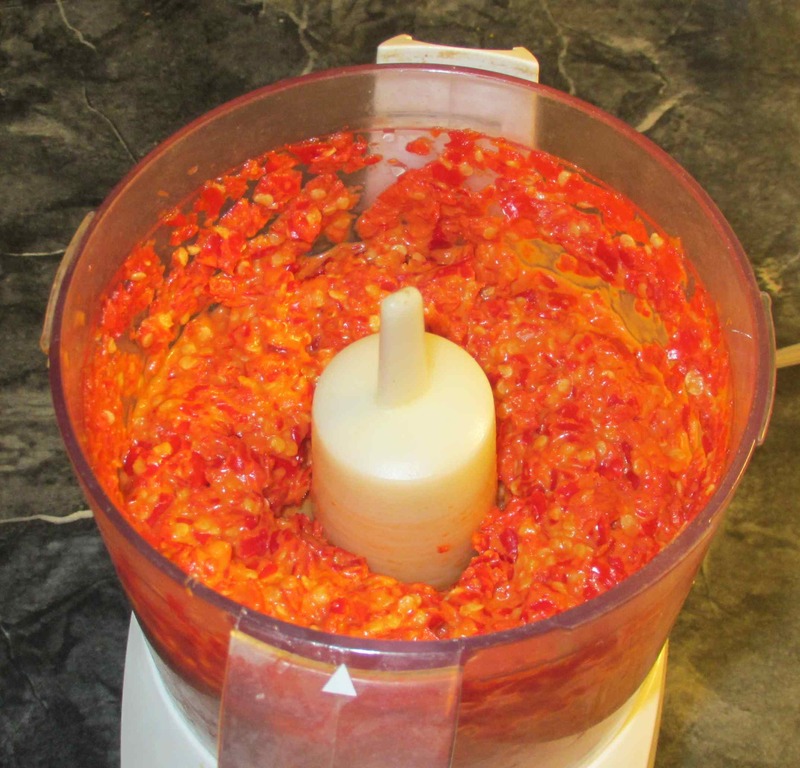 When you are ready, add the chilies and any accumulated juices to the bowl of your food processor along with the sugar (about 2 teaspoons in this case). Pulse well and, as you do so, add oil at about a tablespoon at a time to keep the blades turning nicely. Continue until the paste is as smooth as possible. To be really traditional, you can grind by hand in a mortar. This produces the smoothest result (and some insist that it makes a tastier product) but, while I would do this for a small amount for immediate use, doing large bulk amounts is far easier with some mechanical help. Finally, transfer the paste to a suitable receptacle and let it settle, allowing excess oil to rise to the top. If there isn’t much visible after letting the paste sit for a while, and if you wish to store for a lengthy time, then it is a good idea to add just enough oil so that there is a thin layer covering the surface. Store the paste in the fridge and then use as you would any chili paste. It will be relatively salty (depending on the amount you used) so bear this in mind and adjust for total salt in any recipe you are following. You can freeze the paste if you wish (in which case, the oil is not really necessary) but it keeps very well in the fridge and can taste almost as fresh as new after several months. Reblogged this on The Chilli Pad. Wah…very very hot….even by looking at the pictures! Lee kam Kee cannot compete with you, because its chili paste ism’t that great! Looks wonderful! And I agree: keep it nice and fresh. 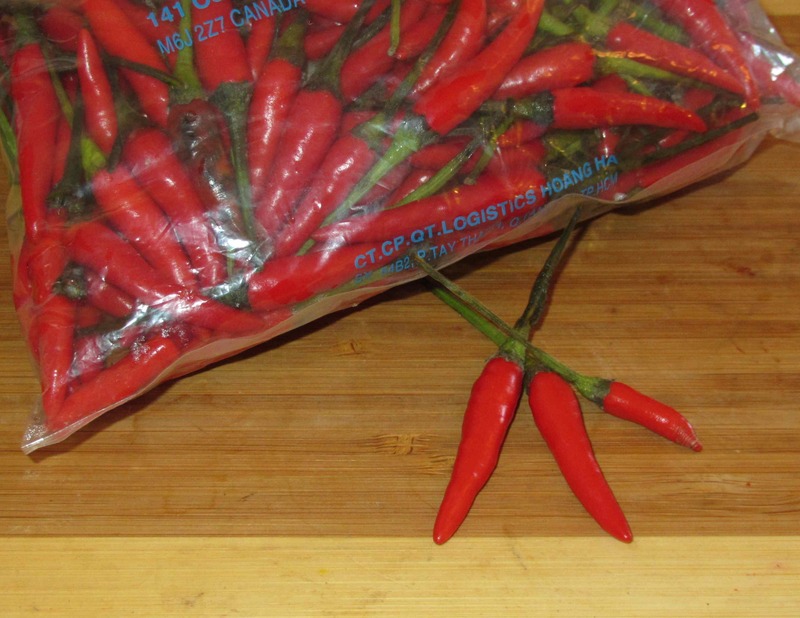 Also, this is a great idea to use up those massive bags of bird’s eye chilies that I never seem to ever finish. I gathered there was quite an Indonesian presence there because of the Dutch East Indies…. must be some great restaurants! Yes, although many of them have “Dutched down” the heat of the food. The famous “rijsttafel” was even invented by the Dutch. The dishes that it consists of are in fact authentic though, it was just serving them all at once in a huge spread to impress one’s guests that was a Dutch invention. I think I read that that was the Dutch spelling before! The salt keeps it very well … it may undergo a bit of lactic acid fermentation. 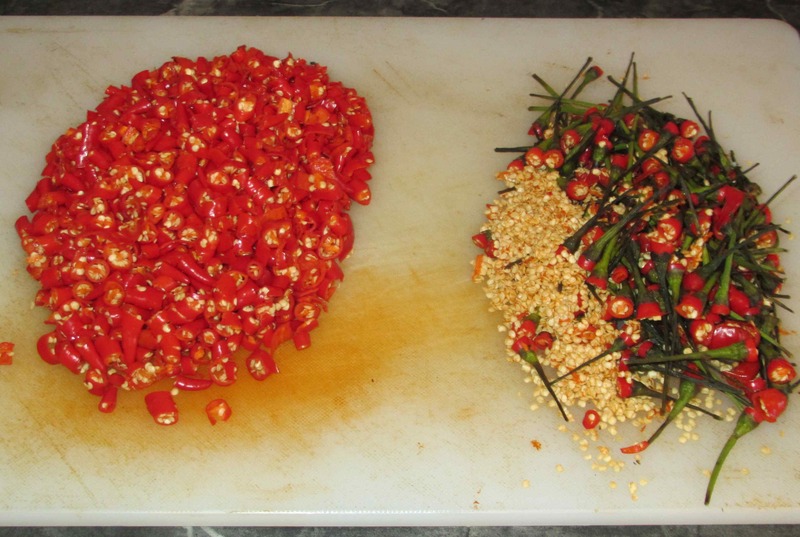 I have some chopped chillies that did…. it adds a bit of sourness and preserving quality. 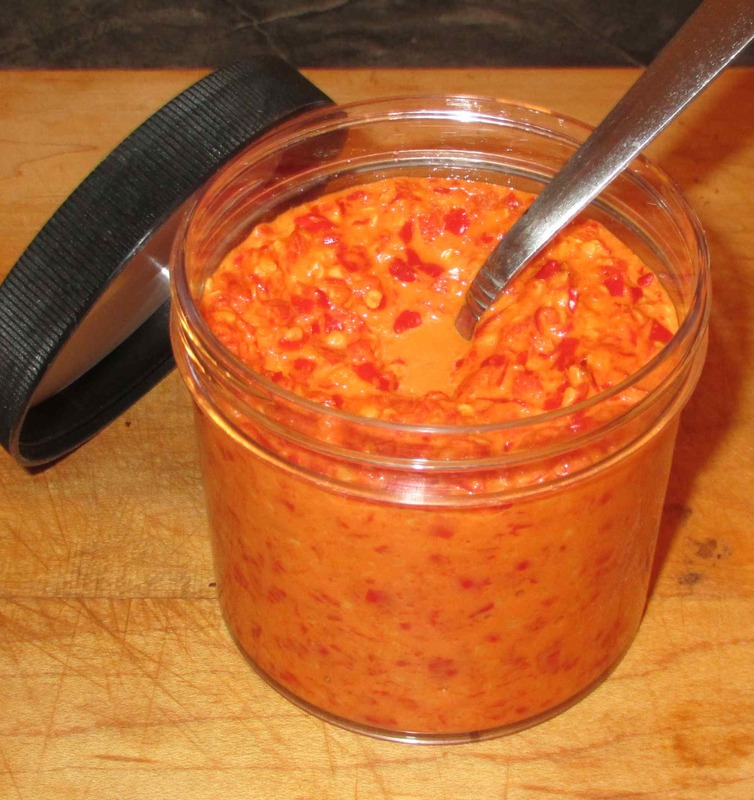 I haven’t had my plain chili pastes do that as far as recall, but I use them quite quickly, so that may be why. Hi. I have frozen chillies. Can they be used instead of fresh (they were freshly frozen). would i have to defrost them or can i chop them in a food processor whilst frozen or slightly thawed. Hmmm …. I haven’t used frozen. I would be inclined to let them thaw then coarsely chop and salt them. After they have sat for a while I suspect they will have thrown off a bit more liquid than the fresh type… maybe just give them a bit of a squeeze before doing the final chopping/processing.